Outcome goals are king in weight management, but they shouldn’t be. I’m going to get off my blood pressure medication. This year I will run a 10k race. Setting criteria you can measure is an excellent way to find and define specific goals. People frequently tell me their weight-related goals are to exercise more this month, eat better, or get back on track. What do these mean? One more step, one more bite of broccoli? Is getting back on track just a frame of mind or an actual set of behaviors? I will eat two cups of vegetables at least four days this week. I will eat something before 9:30 a.m. six days this week. I will track the calories in my snacks after dinner and stay under 300 for at least five days this week. This week I will walk outside or on my treadmill before work for at least 30 minutes. I will go to Zumba class on Saturday. I will wear my Fitbit every day this week and reach 10,000 steps on at least five days. I will walk on my lunch hour on Tuesday, Thursday, and Friday. Generally speaking, the more specific and detailed the plan, the better. On one occasion, however, I got more information than I bargained for. Marie told me her plan was to continue doing resistance training three times per week with rubber tubing. I asked her what days and times she would work out and which exercises she would do. Marie told me she waited until the evening to do her exercises because that’s when her husband was home and he liked to watch her workout. Straight faced she added, “He likes it because I work out in the buff.” Since the success rates for maintaining marriages and fitness programs aren’t so great, I supported this plan. I decided to forego my usual questions about exercise form and technique and assumed she was working all her major muscle groups. Since that day, I always feel the need to wipe down rubber tubing before I use it at the gym! This step of goal setting is where things often fall apart. In our minds we know what’s recommended, ideal, or possible — and so we set goals accordingly. We ignore that the planets would have to align in perfect order to create the circumstances for us to achieve these goals. If you typically eat three vegetables per month, immediately transitioning to five servings per day is highly improbable. Even though 10,000 steps is recommended, increasing from 4,000 to 6,000 may be more realistic in the beginning. This approach worked well for Janet. When Janet told me she was wearing her pedometer faithfully, I didn’t really believe this was true. I couldn’t imagine she was truly walking only 900 to 1,200 steps each day. She must be only wearing it a few hours during the day; maybe the pedometer is a lemon or the batteries are bad. The average American, who is notoriously sedentary, accumulates five times as many steps. Although she was overweight, Janet wasn’t disabled in any way. Her knees seemed to be in shape to handle walking and she didn’t complain of any other limitations. Janet would have to increase her walking by a factor of 10 to reach the recommended 10,000 steps per day. When she described her lifestyle things began to make sense. She was a busy account manager at her firm but worked from home. She parked at her desk all day, only getting up to go to the bathroom or kitchen, both near her office. When she finished working, she would sometimes run an errand or do some light house cleaning, but that was about it for physical activity. In the evening Janet often returned to her computer to finish work, fall into the abyss of social media, or play solitaire. She and her husband would also watch an hour or two of TV. She’d never been an exerciser but was open to the idea of becoming more physically active. She had recently lost weight without exercise but knew her chances of keeping it off were not good unless she moved more. Janet also wanted to feel better. She felt sluggish. Like a toddler who can’t sit still, her body yearned for movement. She started with a goal of 3,000 steps each day, which she achieved easily just by getting out of her chair more during her work day and doing a daily errand that required some walking. After several weeks of this, we set a goal of 5,000 steps per day at least five days per week. She was able to accomplish this on the weekend by doing yard work and more housecleaning. On work days she decided to walk for 20 minutes when she took a break for lunch. Janet enjoyed the concrete aspect of tracking her steps and the challenge of reaching her goals. She was also motivated by the fact that she felt more energetic, could concentrate better throughout the day, and slept soundly at night. sometimes they simply keep us from sliding backward. The next goal was to reach 8,000 steps at least three days per week. Again, the weekends were easier. Janet added a 40-minute walk to her already established weekend routine. She also began taking a 40-minute walk with her husband on Wednesday or Thursday evenings. Janet and I continued to set progressive goals and after six months she took 7,000 to 11,000 steps at least five days per week. We didn’t quite reach 10,000 steps every day, but we were close. Janet was now walking in place during long conference calls and enthusiastically signed up for her first 5K. She was always excited to tell me about her new step record, which finally hit 15,000 per day, thanks to a 40-minute Saturday walk plus a trip to the flea market. Short-term and long-term goals are both important, especially when we focus on losing a substantial amount of weight. Losing 30 pounds means you have to create a 105,000 calorie deficit over an extended period of time. Unfortunately, once you lose weight, the hardest part of weight management awaits you — maintenance. To keep the weight off you’ll need to sustain most of the behavior that helped you lose weight in the first place. A 30-pound weight loss from conventional treatments may take six months to a year as you consistently burn more calories than you consume. Therefore, you’ll need to set many short-term goals along the way. You will have to manage your weight, just as supervisors manage a business, frequently evaluating success and failure while readjusting your goals and objectives. A common error in goal setting is to have long-term goals without setting enough goals for the short run. In some circumstances I discourage long-term goals, such as overall weight loss, until a client has a chance to set short- term behavioral goals and see how much work weight loss requires. A healthy weight is the weight you reach when you do healthy things over an extended period of time. This can’t be determined by a chart, a formula, or even the weight you felt great at 20 years ago. You’re setting yourself up for disappointment if you set a weight goal you can only reach if you behave in a way that isn’t healthy or realistic to sustain. That’s why specific shorter-term goals with a wait-and-see approach are often more effective. You’ll get immediate returns by feeling better and becoming more fit, instead of holding onto a distant “pie in the sky” goal. The idea of that goal may still exist, but it won’t be your main focus. encourage you to be diligent about frequently evaluating your progress. Although no secret formula exists for timing your goals and reviewing progress, I encourage at least weekly goal-setting sessions during the early stages of weight loss. Once a week you can either meet with a professional, a peer, or yourself to review how you did with the previous week’s goals. If you achieved them, how did you do it? If you didn’t, why not? Were your goals unrealistic, not specific enough, or maybe not that important to you? Or was it a problem with execution? Do you need a more specific action plan, such as making sure you go to the grocery store over the weekend and stock up on food to cook healthier meals? Perhaps your goal of exercising in the morning will only work if you have a plan that helps you get to bed earlier the night before. Did you put everyone else’s needs in front of your own? You might reevaluate your thinking. Over time, accomplishing these short-term goals may lead to habits you follow without thinking. When this happens, weight management becomes easier. However, because obesity is a chronic, relapsing condition, I encourage you to be diligent about frequently evaluating your progress. If your behavior starts to drift in the wrong direction, you can quickly identify the problem areas and use goal setting to help you get back on track. This may be as simple as weighing daily and observing your weight graph once a month to spot trends. Some of my long-term clients, even if they’re doing well, return to the office every month or two for exactly this reason. It’s been said that history is made by those who show up. Last week,The New York Times ran a story on First Lieuntenant Marina A. Hierl; Hierl is one of only two women to pass the Marine Corps Infantry Officer Course. Lieutenant Hierl made further history as she was assigned her own platoon to lead. Hierl is one of the people that shows up. Opha May Johnson led the way for women like Lieutenant Hierl and proved that you can make history by showing up first. 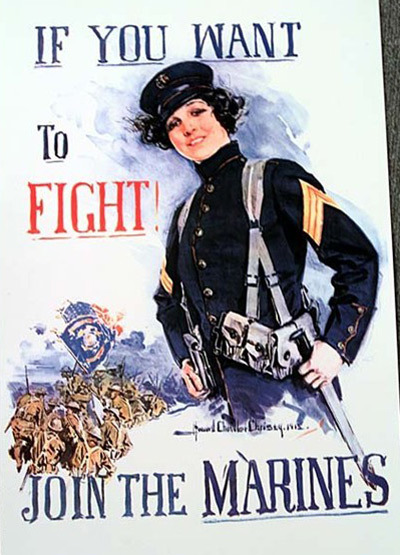 100 years ago today, Johnson earned the distinction of becoming the first woman to enlist in the United States Marine Corps. Born Opha May Jacob in Kokomo, Indiana in 1879, the future Marine attended Wood’s Commercial College. She earned the rank of salutatorian, graduating from the shorthand and typewriting department in 1895. Three years later, she married Victor Johnson, musical director of the Lafayette Square Opera House in Washington D.C. According to the Richmond Time-Dispatch dated September 1, 1918, Johnson was already a civil servant, working for the Interstate Commerce Department, when the chance came up for her to apply to the United States Marine Corps Reserve. The reserve had been established in 1916, concurrent with the U.S.’s involvement in World War I. During the last two years of the war, women were allowed to join branches and reserves to cover responsibilities typically held by men that were under active deployment; 33,000 women would eventually serve support staff. On that day in 1918, Opha May Johnson found herself at the front of the line. Private Johnson became the first of over 300 women that would enlist in the Marine Corps during the remainder of World War I. Her first assignment sent her to Marine Corps headquarters; she worked there as clerk where she managed the records of the other new, female Marines. After the conclusion of World War I in November, 1918, the various branches of the service began discharging all women from active duty. Johnson took a job as a clerk in the War Department (which would be renamed as the Department of Defense in 1949). Johnson died on August 11, 1955, at Mount Alto Veteran’s Hospital in Washington, D.C. Her funeral services coincidentally fell on August 13, 37 years to the day after she enlisted. She is buried in an unmarked grave in Rock Creek Cemetery in D.C. Last year, the Women Marines Association began to fund-raise to install an official marker; the successful project will result in a site unveiling on August 29, with the Commandant of the Marine Corps, General Robert B. Neller, scheduled to speak. Since Johnson’s historic enlistment, thousands of women have served in the U.S. Armed Forces in combat and support capacities. As of 2015, around 2 million veterans in the U.S. were women. Johnson helped pave the way for later Marines like Bea Arthur; before becoming the actress best known for Maude and The Golden Girls, Arthur drove a truck as a member of the Women’s Reserve and attained the rank of staff sergeant during her stateside service in World War II. The late Margaret Brewer, the first female Marine to be made a general, was promoted to brigadier general in 1979. As of May 2018, 92 women serve in combat positions in the USMC; approximately 7% of the 186,000 active Marines are women. Try this balancing act from fitness expert Jessica Smith and Harvard neurologist Marie Pasinski in Smith’s DVD series Walk Strong: Total Transformation 6 Week System. “Walking along an imaginary tightrope engages the part of your brain that coordinates movement and will improve your agility and give you a more youthful stride,” Dr. Pasinski says. 1 With arms swinging naturally by sides, walk forward along a single line on the floor. Step forward right, left, right and then quickly lift left knee in front of hip, tapping the top of left thigh with both hands. 2 Immediately repeat pattern moving backward: Step back left, right, left and then lift right knee up in front of hip, tapping top of right thigh with both hands. 3 Repeat steps for a total of 4 reps. Then reverse, starting with left foot leading forward first for 4 additional reps. Add 1-3 sets to your regular workout any time you want to strengthen your body and your mind at the same time.